It’s no secret that Menke’s is Newburgh’s number one destination for foreign and domestic vehicle repair, but did you know that we’re also top rated for commercial fleet services? For over thirty years, we’ve worked with local Evansville and Newburgh businesses to keep operations flowing smoothly. We understand that whether your fleet numbers one or one hundred, time means money in business. That’s why we take special pride in providing prompt expert service that keeps your company on the road and protects your interest in the bottom line. Menke’s loves local businesses, and we love working hard to keep our fellow entrepreneurs happy. Menke’s has the special resources it takes to keep your fleet on time and on the road. Bring on the trucks and vans. Our staff is ready to devote the manpower and dedication it takes to tackle large jobs and corporation level assignments! With over thirty years of experience dealing with other companies’ needs, we know that it takes special attention to learn each unique business’s operations and deadlines. We take the extra time it takes to get to know you and your schedule, and work with you to create custom schedules and pricing options. That’s why we’ve been able to create a proud tradition of maintaining long term relationships with entrepreneurs and business owners at every level. Menke’s has grown a lot over the decades, and we’re committed to helping you grow, too. We sincerely hope that you’ve done your research, because there’s a good reason that businesses choose Menke’s first. We’re the only AAA Approved Repair Facility in Southern Indiana, and we’ve been consistently rewarded for our reliable and exacting maintenance work. In 2009, Menke’s was chosen as the top shop out of 165,000 surveyed garages by Motor Age magazine, and we’ve been committed to growing bigger and more experienced every year since. If that’s not proof enough, Menke’s was also awarded the ASE Blue Seal of Excellence and an Angie’s Super Service Award. With credentials like these, you can be confident that you’ve made a good business decision. Call today to find out more about our custom options and pricing details for commercial fleet services. We love talking shop with our fellow business owners! 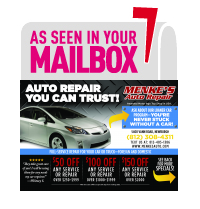 Discover why Menke’s has been leading the way in automotive repair for over thirty years. Thank you for visiting Menke's Automotive in Newburgh Indiana where we specialize in the complete maintenance and repair of all foreign and domestic vehicles. ASK ABOUT OUR FREE LOANER VEHICLES. CALL (812) 853-5571 or CLICK HERE ONLINE to schedule your appointment.